Chris Goslin. Atlanta United photo. Chris Goslin and Miles Robinson will join the Charleston Battery on loan for week ten of the USL season. Goslin, Robinson and goalkeeper Alex Tambakis will all be available for selection for the Battery’s matches against Bethlehem Steel FC on Thursday, May 25 and New York Red Bulls II on Sunday, May 28. 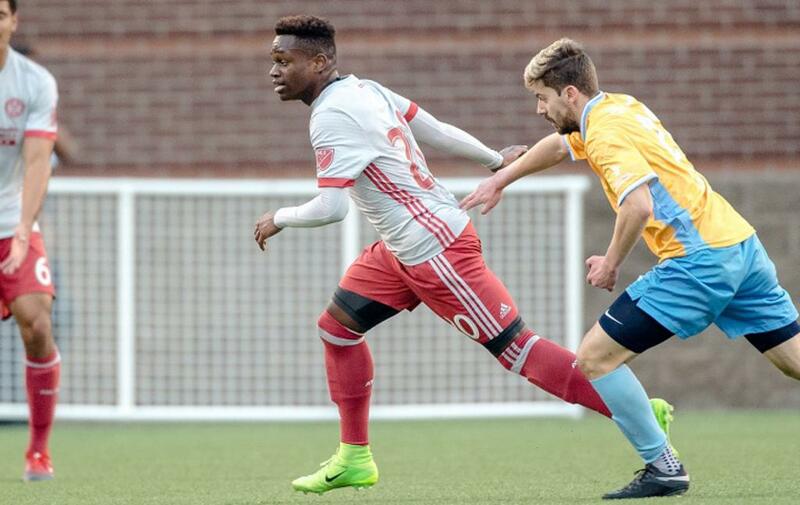 Goslin, a 17-year old homegrown midfielder, played with Charleston in 2016, appearing in the team’s friendlies against Rangers FC and the Nigerian Olympic Team. The U.S. youth international also played with the Battery in the first match of the Carolina Challenge Cup in February. Robinson, a 20-year old center back, could earn his first professional minutes this week with the USL side. The first-round draft pick will provide cover for the suspended Forrest Lasso on Thursday against the Steel. Goslin, Robinson, and Tambakis are expected to return to Atlanta United first team training following Sunday’s match against Red Bulls II.